With so little time and so much ground to cover in this country, we hired a car today to bring us to Hue, about 3 hours north of Hoi An, in order to see the countryside and a couple of important sights before flying to Saigon this evening. After another delicious breakfast, we climbed into our Ford sedan and kicked off the day by visiting My Son, an ancient city that dates back to the 4th century. 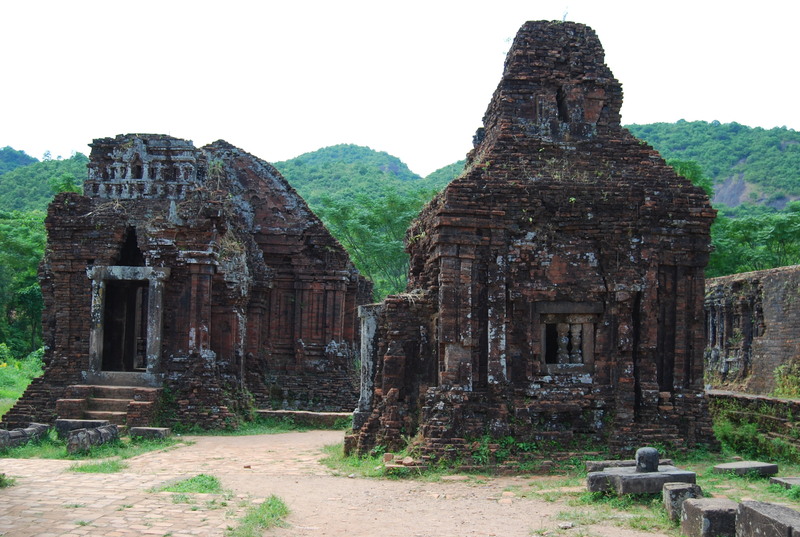 The ruins are some of the best preserved in Vietnam — since the Cham people were one of the few, if only, to build with stone, not wood, which stood up to the harsh climate — and are another Unesco World Heritage Site. Passing chili peppers drying on the side of the road and mile after mile of rice paddies, we arrived in the lush valley at the base of Cat’s Tooth Mountain and set out along a dirt path. It didn’t take long for us to come across My Son, whose impressive brick structures were (quite amazingly) not built with any mortar. No one else was around, so we basically had the place to ourselves. Well, us and the sun. We hopped back in the car and continued onward to Hue – which has a few a Unesco sites of its own. The Ford handled the windy roads well although our driver wasn’t the friendliest fellow. He also strictly and strangely abided by the speed limit, which we’re not sure anyone else in this country does. We got passed by bicycles – not motorbikes – several times and bowed our heads in embarrassment. 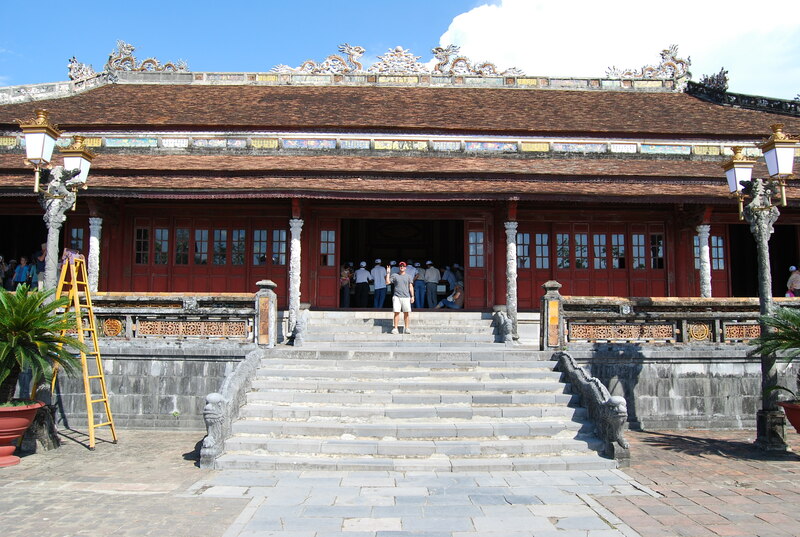 A little after 1 p.m., we arrived in Hue, the capital of Vietnam from 1802 – 1945. 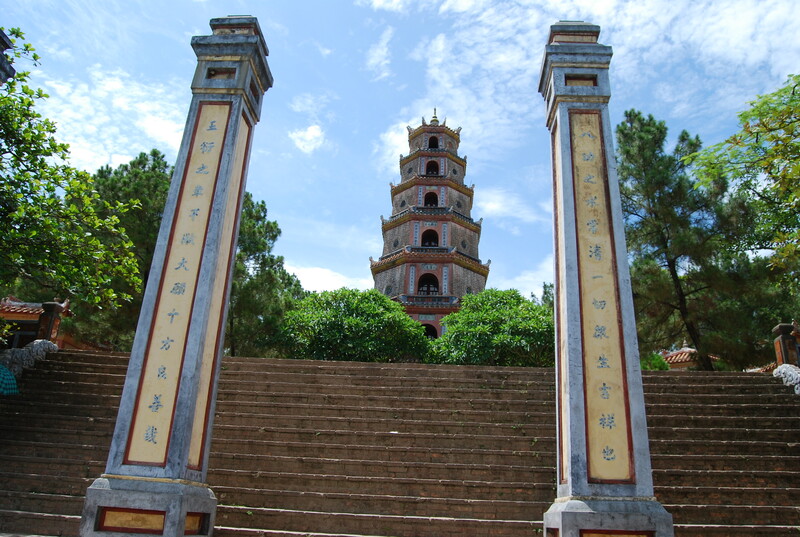 The sun was reaching its peak as we disembarked at Thien Mu Pagoda, which founded in 1601, is one of Vietnam’s most iconic structures. Overlooking the Perfume River, it’s a peaceful — and largely deserted — spot, especially with the tremendous heat coming from above. Drained from the weather, we asked our driver to bring us to La Residence, the chic boutique hotel that my parents will be staying at during their upcoming trip to Asia. Housed in the former French Governor’s house and surrounded by beautiful and lush gardens, the restaurant served up a delicious (and crust-less) chicken club sandwich and plate of crinkle fries. We were happy. Happy enough, at least for the time being, to brave the sun again. We walked through the Citadel and Forbidden Purple City, a kind of Diet Forbidden City that was completely demolished by the U.S. in the late 60s. Reconstruction is underway, but for the time being, there isn’t much to see — besides a lot of other tourists. Afterwards, we drove at exactly 35 kilometers/hour (the speed limit) to the Tomb of Tu Doc, a Vietnamese emperor in the 19th century, set among pine trees and overlooking a small lake. 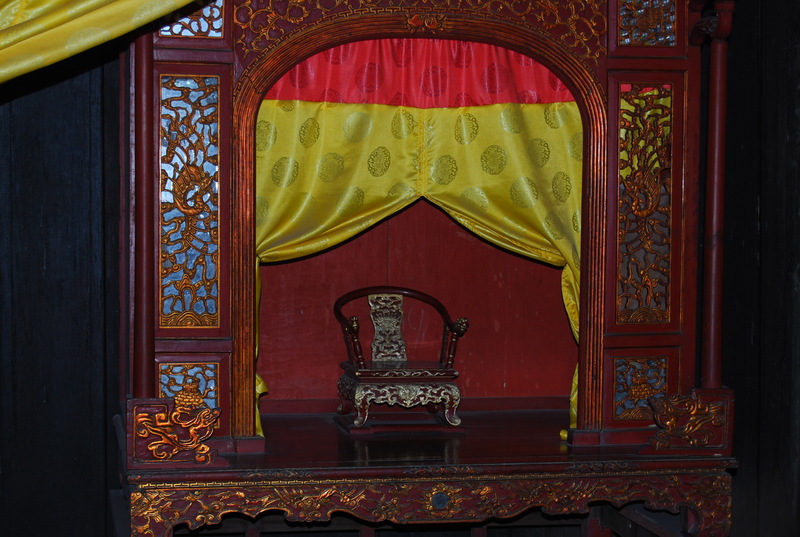 Hopefully, his power wasn’t correlated with the size of his throne, which looked small enough for a 2-year-old. Whether it was the heat, lack of sights or general trip fatigue, we found Hue a pretty passable city. Now in this home stretch of my trip, I’m finding it more and more difficult to enjoy and really appreciate what I’m doing — so much of my thinking is revolving around my return to the States. 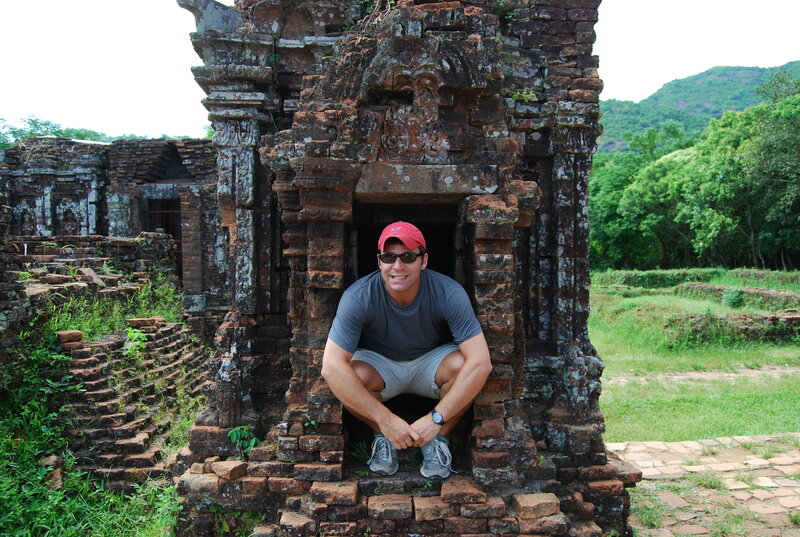 But in this case, it didn’t really seem to matter as Hue offered little, and we’d much rather have spent an extra day in Hoi An. Our car dropped us off at the tiny Hue International Airport — where international flights go to from here is anyone’s guess. We waited until the counter agents arrived to check us in and then played a couple games of Uno! (Marc: 3; Burt: 1). By the time we got on the propeller, it was past 8 p.m., about 90 minutes later than we’d been originally scheduled to depart. After our somewhat scary Vietnam Airlines flight from Hanoi, neither of us were very excited about our trip. Alas, it was much better — although quite slow: 325 miles in 2 hours. Wheels were down on this 19th flight of mine at close to 10 p.m., and after grabbing our backpacks, we found a metered taxi to whisk us to our penultimate home, the beautiful Park Hyatt Saigon.